پرنیان, محمدجواد, مرتضوی, یدالله, طاهری نجف آبادی, علی, خدادادی, عباسعلی. (1392). استفاده از روش ترسیب شیمیایی فاز بخار برای لایه نشانی روتنیوم از پیش ماده 12(CO)3Ru بر روی کاتالیست 3O2Co/Al و بررسی عملکرد کاتالیست در واکنش فیشر تروپش. 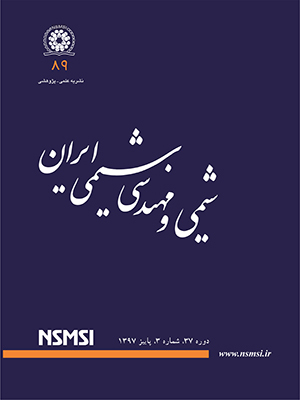 نشریه شیمی و مهندسی شیمی ایران, 32(4), 17-32. محمدجواد پرنیان; یدالله مرتضوی; علی طاهری نجف آبادی; عباسعلی خدادادی. "استفاده از روش ترسیب شیمیایی فاز بخار برای لایه نشانی روتنیوم از پیش ماده 12(CO)3Ru بر روی کاتالیست 3O2Co/Al و بررسی عملکرد کاتالیست در واکنش فیشر تروپش". نشریه شیمی و مهندسی شیمی ایران, 32, 4, 1392, 17-32. پرنیان, محمدجواد, مرتضوی, یدالله, طاهری نجف آبادی, علی, خدادادی, عباسعلی. (1392). 'استفاده از روش ترسیب شیمیایی فاز بخار برای لایه نشانی روتنیوم از پیش ماده 12(CO)3Ru بر روی کاتالیست 3O2Co/Al و بررسی عملکرد کاتالیست در واکنش فیشر تروپش', نشریه شیمی و مهندسی شیمی ایران, 32(4), pp. 17-32. پرنیان, محمدجواد, مرتضوی, یدالله, طاهری نجف آبادی, علی, خدادادی, عباسعلی. استفاده از روش ترسیب شیمیایی فاز بخار برای لایه نشانی روتنیوم از پیش ماده 12(CO)3Ru بر روی کاتالیست 3O2Co/Al و بررسی عملکرد کاتالیست در واکنش فیشر تروپش. نشریه شیمی و مهندسی شیمی ایران, 1392; 32(4): 17-32. در این پژوهش ارتقادهنده ‌ی روتنیوم با روش ترسیب شیمیایی فاز بخار به کاتالیست کبالت بر پایه ‌ی آلومینا افزوده شد. کاتالیست‌ها‌ دارای 15% وزنی کبالت بوده و به روش تلقیح تر ساخته شده ‌اند. پیش ماده تری‌روتنیوم ‌دودکا‌کربونیل (Ru3(CO)12) برای این فرایند استفاده شد. برای بهینه نمودن فرایند ترسیب شیمیایی فاز بخار شرایط انجام این فرایند به طور کامل توسط IR و TGA بررسی شد و دمای مناسب برای ترسیب روتنیوم روی کاتالیست کبالت بر پایه‌ آلومینا انتخاب شد. در اثر افزودن ارتقادهنده، احیا‌پذیری کاتالیست بهبود یافت که این موضوع با افزایش درصد تبدیل CO در واکنش فیشر تروپش تأیید شد. واکنش فیشر تروپش در دماهای 240-210 درجه سلسیوس و نسبت خوراک 3و 2و1=H2/CO صورت گرفت. نمونه‌ ارتقاداده شده، گزینش ‌پذیری برای فراورده ‌های سنگین هیدروکربنی را نسبت به کاتالیست مرجع بهبود داد. همچنین در تمام دماها و نسبت‌های خوراک گوناگون، عملکرد کاتالیست‌ ارتقا داده شده از کاتالیست مرجع بدون ارتقا دهنده بهتر بود. Dry M E, The Fischer-Tropsch Process 1950-2000, Catalysis Today, 71, p. 227 (2002). Arne Dinse, Max Aigner, Markus Ulbrich, Effects of Mn Promotion on the Activity and Selectivity of Co/SiO2 for Fischer-Tropsch Synthesis, Journal of Catalysis, 288, p. 104 (2012). Li S Z, Krishnamoorthy S, Li AW, Meitzner AW, Iglesia E, Promoted Iron-Based Catalysts for the Fischer-Tropsch Synthesis: Design, Synthesis, Site Densities, and Catalytic Properties, Journal of Catalysis, 206, p. 202 (2002). Chengchao Liu, Jinlin Li, Yuhua Zhang, Sufang Chen, Junjiang Zhu, Kongyong Liew, Fischer-Tropsch Synthesis Over Cobalt Catalysts Supported on Nanostructured Alumina with Various Morphologies, Journal of Molecular Catalysis A:Chemical, 363–364, p. 335 (2012). Ali Karimi, Ali Nakhaei Pour, Farshad Torabi, Behnam Hatami, Ahmad Tavasoli, Mohammad Reza Alaei, Mohammad Irani, Fischer-Tropsch Synthesis over Ruthenium-Promoted Co/Al2O3 Catalyst with Different Reduction Procedures, Journal of Natural Gas Chemistry, 19, p. 503 (2010). Jacobs G, Das T K, Zhang Y Q, Li J L, Racoillet G, Davis B H, Fischer-Tropsch Synthesis: Support, Loading, and Promoter Effects on the Reducibility of Cobalt Catalysts, Applied Catalysis A Gen, 233, p. 263 (2002). Hosseini S A, Taeb A, Feyzi F, Yaripour, F. Fischer–Tropsch Synthesis over Ru Promoted Co/γ-Al2O3 Catalysts in a CSTR, Catalysis Communication, 5, p. 137 (2004). Zhang J.L, Chen J.G, Ren J., Sun Y.H, Chemical Treatment of γ-Al2O3 and Its Influence on the Properties of Co-Based Catalysts for Fischer-Tropsch Synthesis, Applied Catalysis A Gen, 243, p. 121 (2003). Sang-Hoon Song, Sang-Bong Lee, Jong Wook Bae, P.S. Sai Prasad, Ki-Won Jun, Influence of Ru Segregation on the Activity of Ru–Co/γ-Al2O3 During FT Synthesis: A Comparison with That of Ru–Co/SiO2 Catalysts, Catalysis Communications, 9, p. 2282 (2008). غلامرضا مرادی، محمد مهبد بصیر و عباس طائب، تاثیر زیرکونیم روی مشخصات فیزیکی وعملکرد کاتالیست کبالت در سنتز فیشر- تروپش، نشریه شیمی و مهندسی شیمی ایران، (2)22, (1382). Li Ch, Sun Q, Cao F, Ying W, Fang D, Pretreatment of Alumina and Its Influence on the Properties of Co/Alumina Catalysts for Fischer-Tropsch Synthesis, Journal of Natural Gas Chemistry, 16, p. 308 (2007). Shreyas Rane, Øyvind Borg, Jia Yang, Erling Rytter, Anders Holmen, Effect of Alumina Pphases on Hydrocarbon Selectivity in Fischer-Tropsch Synthesis, Applied Catalysis A: General, 388, p. 160 (2010). Khodakov A Y, Chu W, Fongarland P. Advances in the Development of Novel Cobalt Fischer−Tropsch Catalysts for Synthesis of Long-Chain Hydrocarbons and Clean Fuels, Chem Rev 107(2007)1692-1744. Tsubaki N., Sun S., Fujimoto K., Different Functions of the Noble Metals Added to Cobalt Catalysts for Fischer–Tropsch Synthesis, Journal of Catalysis 199, p. 236 (2001). Seon-Ju Park, Jong Wook Bae, Yun-Jo Lee, Kyoung-Su Ha, Ki-Won Jun, Prashant Karandikar, Deactivation Behaviors of Pt or Ru Promoted Co/P-Al2O3 Catalysts During Slurry-Phase Fischer-Tropsch Synthesis, Catalysis Communications 12, p. 539 (2011). Wenping Ma, Gary Jacobs, Robert A. Keogh, Dragomir B. Bukur, Burtron H. Davis, Fischer-Tropsch Synthesis: Effect of Pd, Pt, Re, and Ru Noble Metal Promoters on the Activity and Selectivity of a 25%Co/Al2O3 Catalyst, Applied Catalysis A: General, 437-438, p. 1 (2012). Li J.L., Zhan X.D., Zhang Y., Jacobs G., Das T., Davis B.H., Fischer-Tropsch Synthesis: Effect of Water on the Deactivation of Pt Promoted Co/Al2O3 Catalysts, Applied Catalysis A: Gen, 228, p. 203 (2002). Jacobs G., Patterson P.M., Zhang Y., Das T., Li J.L., Davis B.H., Fischer-Tropsch Synthesis: Deactivation of Noble Metal-Promoted Co/Al2O3 Catalysts, Applied Catalysis A: Gen, 233, p. 215 (2002). Jones A.C., Hitchman M.L., "Chemical Vapour Deposition Precursors, Processes and Applications", Royal Society of Chemistry (2009). Ohring M., “Materials Science of Thin Films (Second Edition)", Deposition and Structure, Elsevier, pp. 277–355, (2002). Smith K.C., Sun Y.M., Mettlach N.R., Hance R.L., White J.M., Evaluation of Precursors for Chemical Vapor Deposition of Ruthenium, Thin Solid Films, 376, p. 73 (2000). Cai T., Song Z., Chang Z., Liu G., Rodriguez J.A., Hrbek J., Ru Nanoclusters Prepared by Ru3(CO)12 Deposition on Au(111), Surface Science, 538, p. 76 (2003). Viguie J.C., Spitz J., Chemical Vapor Deposition at Low Temperatures, Journal of Electrochemical Society, 122, p. 585 )1975(. Rushworth S., Odedra R., Viswanathan P., Dosanjh S., Lealman I., Development and Characterisation of Improved Ruthenium Dopant Sources, Journal of Crystal Growth, 310, p. 4712 (2008). Xueying Zhao, Jan Hrbek, Jose´ A. Rodriguez, The Decomposition and Chemistry of Ru3(CO)12 on TiO2(1 1 0) Studied with X-Ray Photoelectron Spectroscopy and Temperature Programmed Desorption, Surface Science, 575, p. 115 (2005). Trent D.E., Paris B., Krause H.H.,Vapor Deposition of Pure Ruthenium Metal from Ruthenocene, Inorganic Chemistry, 3, p. 1057 )1964(. Kelly M. Thom, J.G. Ekerdt, Surface Chemistry of (2,4-Dimethylpentadienyl) (Ethylcyclopentadienyl) Ru on Polycrystalline Ta, Surface Science, 603, p. 921 (2009). Reui-san Chen, Ying-sheng Huang, Yao-lun Chen , Yun Chi, Preparation and Characterization of RuO2 Thin Films from Ru(CO)2(tmhd)2 by Metalorganic Chemical Vapor Deposition, Thin Solid Films, 413, p. 85 (2002). Pakkanen Tapani A, Hirva Pipsa, Venalainen Tapani, Controlled Deposition from the Gas Phase of Surface Species on Amorphous Supports: Preparation of Ruthenium-Bipyridine Catalysts for 1-Hexene Hydroformylation and Water-Gas Shift Reaction, Journal of Catalysis 148, p. 722 (1994). Reuel R.C., Bartholomew C.H., The Stoichiometries of H2 and CO Adsorptions on Cobalt: Effects of Support and Preparation, Journal of Catalysis, 85, p. 63 (1984). Jones R.D., Bartholomew C.H., Improved Flow Technique for Measurement of Hydrogen Chemisorption on Metal Catalysts, Applied Catalysis, 39, p. 77 (1988). Jacobs G., Patterson P.M., Zhang Y., Das T., Li J., Davis B.H., Fischer-Tropsch Synthesis: Deactivation of Noble Metal-Promoted Co/Al2O3 Catalysts, Applied Catalysis A:General, 233, p. 215 (2004). Hosseini S.L., Taeb A., Feizi F., Yaripour F., Fischer-Tropsch Synthesis over Ru Promoted Co/γ-Al2O3 Catalysts in a CSTR, Catalysis Communication, 5, p. 137 (2004). Sang-Hoon Song, Sang-Bong Lee, Jong Wook Bae, P.S. Sai Prasad, Ki-Won Jun, Influence of Ru Segregation on the Activity of Ru–Co/γ-Al2O3 During FT Synthesis: A Comparison with that of Ru-Co/SiO2 Catalysts, Catalysis Communications, 9, p. 2282 (2008). Chengcheng Ma, Nan Yao, Qian Han, Xiaonian Li, Synthesis and Application of γ-Al2O3 Supported CoRu-Based Fischer-Tropsch Catalyst, Chemical Engineering Journal, 191, p. 534 (2012). Farzad S., Haghtalab A., Rashidi A., Comprehensive Study of Nanostructured Supports with High Surface Area for Fischer-Tropsch Synthesis, Journal of Energy Chemistry, 22, p. 573 (2013). de la Osa A.R., De Lucas A., Romero A., Valverde J.L., Sánchez P., Performing the Best Composition of Supported Co/SiC Catalyst for Selective FTS Diesel Production, Fuel, 90, p. 1935 (2011). Bechara R., Balloy D., Vanhove D., Catalytic Properties of Co/Al2O3 System for Hydrocarbon Synthesis, Applied Catalysis A: General, 207, p. 343 (2001). Rohr F., Lindvag O.A., Holmen A., Blekkan E.A., Fischer-Tropsch Synthesis over Cobalt Catalysts Supported on Zirconia-Modified Alumina, Catalysis Today, 58, p. 247 (2000). Sølvi Storsæter, Bård Tøtdal, John C. Walmsley, Bjørn Steinar Tanem, Anders Holmen, Characterization of Alumina-, Silica-, and Titania-Supported Cobalt Fischer-Tropsch Catalysts, Journal of Catalysis, 236, p. 139 (2005).